Over-priced, over-hyped and over here. That, in a nutshell, is what I think of Five Guys, the American burger franchise which opened recently in Dundrum. I also have an invitation that I want to extend to Barack Obama who, despite the fact that POTUS doesn’t do burger endorsements, is widely understood to be a Five Guys fan. In his retirement, I’m hoping he manages to get to visit Bunsen Burger in Dublin to see how great, and yet how simple, a proper hamburger can be. You see, I worship at the altar of the humble hamburger, believing, as I do, that it can be a thing of beauty. The best one I’ve ever had was at Bunsen a year or so ago. When the waitress (they bring you the food) asked how I wanted it cooked, I threw caution to the winds and replied ‘however the kitchen thinks it should be served’. I knew that this would be rare, the vaguely risky choice that grown-ups should be allowed to make on an informed basis. And boy, was I glad I did. I may have ended up looking like a suspect in CSI, with gory wrists liberally adorned with undercooked meat juices (a.k.a. blood) but this was the best burger that has ever passed my lips. Thank you, Bunsen, for opening my eyes to what a burger can be. Anyway, that’s why I think Mr Obama should take in Bunsen on his next visit to Ireland. It puts Five Guys in its place. 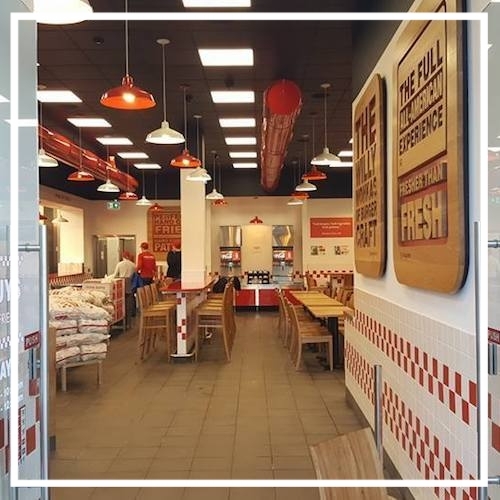 Five Guys, owned in Ireland, as I understand, by offspring of Dermot Desmond, is currently a big, bright fast food restaurant that was, on a Monday night, packed. The centrepiece seemed to be bags of spuds piled in front of the counter, each emblazoned with the Five Guys logo. Behind said counter, a couple of dozen young people flipped burgers, assembled them, dispensed milkshakes and yelled out your order number so that you could collect your grub. So, quite like McDonald’s but less dignified. There are, I’ve read, some 2,500 variations on what you can order, depending on how you ‘curate’ your burger, as I’m starting to think of it. In the interests of science, we ordered not just two hamburgers and fries... dammit, chips! When did we start calling chips fries? We also tried to order a hot dog but they had sold out. So, in the fulness of time (about 10 minutes) we heard a shout of ‘46!’ and collected our loot. The bag seemed to have been filled with chips in much the same way as a bean bag is filled with polystyrene beads. On closer examination, some of the chips were contained in tall paper cups, like the ones you get a large Coca-Cola in if you’re familiar with the Golden Arches. Beneath a thick layer of chips lay two foil packages containing – deep breath – a cheeseburger with mayo, tomato, lettuce, onion and bacon on the one hand; and, on the other, a hamburger with pickles, ketchup and jalapenos. The latter cost €7.95, the former €9.95 or, as I prefer to call it, a tenner. Let’s deal with the chips first. They are skin-on, which is fine if the spuds are organically grown. I don’t like skin-on spuds because the conventional sort are sprayed with chemicals to inhibit sprouting. Five Guys’ spuds may be as innocent as the driven snow, but I’d like to be told. Anyway, let’s just say that Burdock’s have nothing to fear. And, to be frank, McDonald’s does a crisper, more chip-like chip. The abundance of these chips was in inverse proportion to the quality. They would have let down a spiceburger in an all-night takeaway in Drimnagh. They were even less impressive than the buns which put up no fight and compressed into a thin, doughy layer. Desperately trying to find a redeeming feature in the burgers – each of them comprising two flabby, flaccid rounds of meat in a bun – we decided that the bacon was definitely crisp. The cloying pickles tasted as if they had been marinated in corn syrup but the jalapenos had the virtue of being hot. Burgers should have a touch of crust; these didn’t. Burgers should taste meaty; these had as much flavour as the foil in which they were wrapped. Good burgers make you want to come back; these didn’t. Much play is made of the fact that everything is fresh, nothing frozen. Well, you know what? I just don’t care. Give me meat with proper flavour that has been frozen and I’ll thank you. This, along with a bottle of Heineken and a bottle of water, came to €30.35. I had to pinch myself.